Jacquelyn MartinTreasury Secretary Steven Mnuchin, right, shows his wife Louise Linton a sheet of new $US1 bills on November 15, 2017. Scrutiny over how some members of President Donald Trump’s cabinet have spent taxpayer money isn’t dying down. The latest official to come under the microscope is Treasury Secretary Steve Mnuchin, who was found to have cost taxpayers more than $US1 million in combined airfare after taking eight separate government trips during a an eight-month period last year. Citizens for Responsibility and Ethics in Washington (CREW), a non-profit government watchdog group, obtained documents detailing Mnuchin’s travels after filing a Freedom of Information Act request. Mnuchin isn’t the only Trump administration official who has come under fire for alleged misuse of taxpayer funds. Between March and October last year, Mnuchin racked up more than $US1 million in airfare, according to documents obtained by Citizens for Responsibility and Ethics in Washington (CREW), a non-profit government watchdog group. In every instance, Mnuchin flew on military aircraft rather than on commercial, which would have cost far less. In August 2017, Mnuchin came under fire for a a $US26,900 flight to Kentucky on an Air Force jet, a trip that coincided with the August 21 solar eclipse. Mnuchin and his wife, Louise Linton, viewed the eclipse from the lawn of Fort Knox, just outside the eclipse’s path of totality. 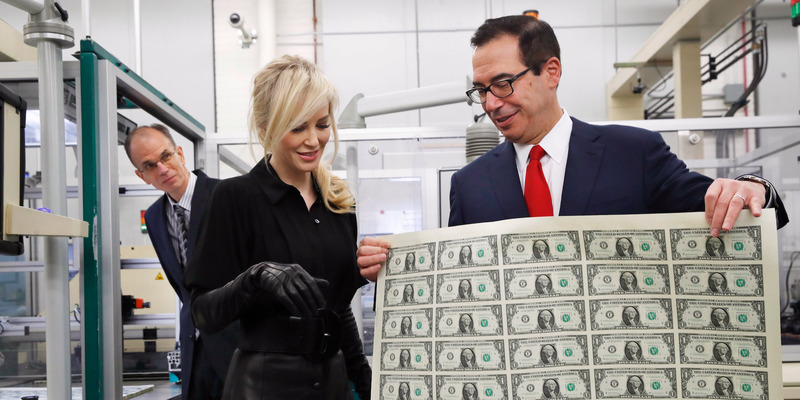 The Treasury secretary’s activities also raised questions when it was reported that Mnuchin requested to fly on a US military jet for his honeymoon to Europe. The trip could have cost $US25,000 per hour, but it was ultimately scrapped after consideration by officials at the Treasury Department. On March 8, the Associated Press reported that Zinke’s office spent nearly $US139,000 to renovate three sets of office doors allegedly in need of repair. A spokesperson for Zinke later explained the situation and said the secretary was not a part of the decision to authorise the payment. An official at the Interior Department told CNN that the doors being renovated were so damaged that they weren’t able to stop rainwater from coming in during a storm. Before Thursday’s news about the office doors surfaced, Zinke was involved in another spending controversy. The Associated Press reported in December that Zinke spent more than $US53,000 on three helicopters trips. Earlier this month, Carson came under fire when his staff reportedly said they were attempting to cancel an order for a $US31,000 mahogany dining set to replace the 50-year-old table currently in Carson’s office. Carson’s business manager said the secretary intended to cancel the order, but that it might not be possible. The Inspector General released a report in February that implicated Shulkin’s chief of staff in “serious derelictions” for doctoring emails to ensure that the government would pay travel expenses for the secretary’s wife on a trip to Europe. Vivieca Wright Simpson, the chief of staff, retired in response to the report, which also accused Shulkin of improperly accepting tickets to the Wimbledon tennis tournament during a government trip. He did, however, ultimately reimburse the government for his wife’s airfare. Shulkin was appointed to an under secretary position at the Department of Veteran Affairs by former President Barack Obama in 2015. Last month, the Washington Post reported that Pruitt regularly spends thousands of taxpayer dollars on domestic and international airfare, staying at upscale hotels, for trips that are often not entirely relevant to his work as a cabinet official. In one example, Pruitt spent more than $US1,600 on a first-class plane ticket from Washington to New York in June 2017 in order to make two brief television appearances to promote the president’s decision to withdraw from the Paris climate agreement. Pruitt defended his first-class air travel. 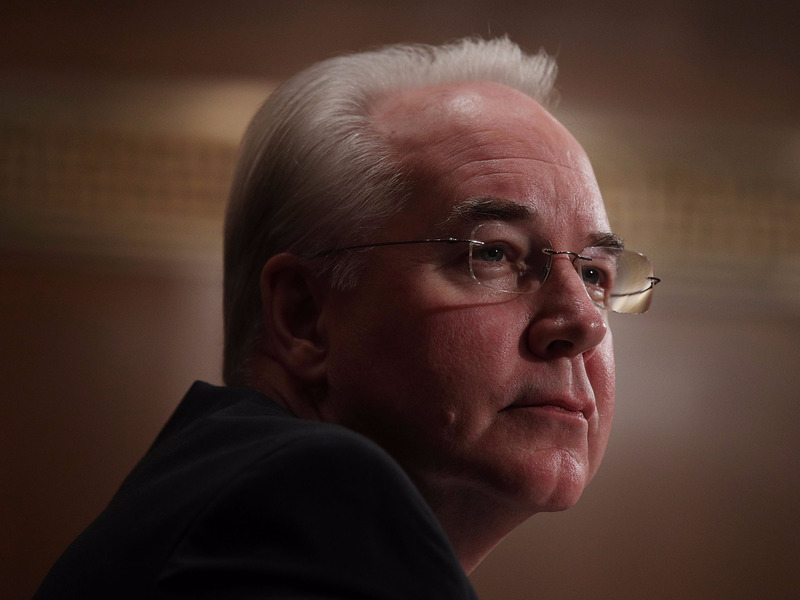 Price resigned from his post in late September 2017 after sparking bipartisan outrage over his extensive use of chartered flights. Price’s travel cost taxpayers more than $US1 million. Politico found 24 instances in which Price opted for a private jet over commercial flights, at a price tag of more than $US400,000, while his the cost for his use of military jets exceeded $US500,000.